I read this book recently and I have already recommended it to several people. If I wrote a book it could easily have been this one, it could actually have my name on the front cover as the author! This book absolutely reflects the work I do each and every day with my clients. In addition to this it is so clearly written and well explained. The science bit about how our brain functions and how negative thinking habits develop is explained in such easy terms that make this book accessible to many. The self-help techniques suggested in this book are ones I use and offer to my clients, so I know for sure that they work. This book affirms how positive self-talk and positive repetition of positive suggestions creates new neural pathways by changing the neuroplasticity around our brain cells to resolve personal difficulties and issues that have become entrenched into the psyche by unhelpful repetitive negative thoughts, self-talk and behaviours, which as a consequence have become a bad habit. Hereby encouraging everyone to take individual responsibility to take back their control of their own unhelpful negative thought processes and self-talk to promote healthy life changing thoughts, feelings, behaviours and experiences. As a self-help book this book is on the top of my list as one of the best! 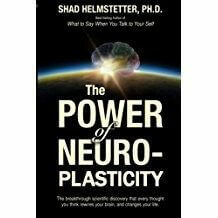 In The Power of Neuroplasticity, best – selling author Shad Helmstetter, Ph.D., (author of 16 books in the field of personal growth, founder and chairman of The Life Coach Institute and a repeat guest on Oprah Winfrey) presents the latest results from research in the field of neuroscience, and shows how this research can change your life. He reveals the seven important new rules of neuroplastic programming, and shows you can literally rewire your brain for success. You will learn the latest scientific breakthroughs in how to improve your IQ, overcome negative thinking, stay mentally younger and sharper, and grow positive new neurons and healthy mental pathways in your brain that will help you do better in every area of your life. This is a book for everyone who wants to make life work better – with neuroscience firmly on your side.